Summer school is still more fun than school, but that is exactly what we have needed. There has been shopping, video game playing, reading, LEGO playing, and Doctor Who watching - for the record we are in the 9th season and soon to be in Doctor Who withdrawal. Yesterday we celebrated Fred's birthday, so he and I are once again the same age. Those are always a long 20 days that I'm "older" than him. Amber loved her long awaited first session of Project Write this week (see last week's update for a description). Her group already has their plot sketched out and characters assigned. She's greatly looking forward to the next meeting. 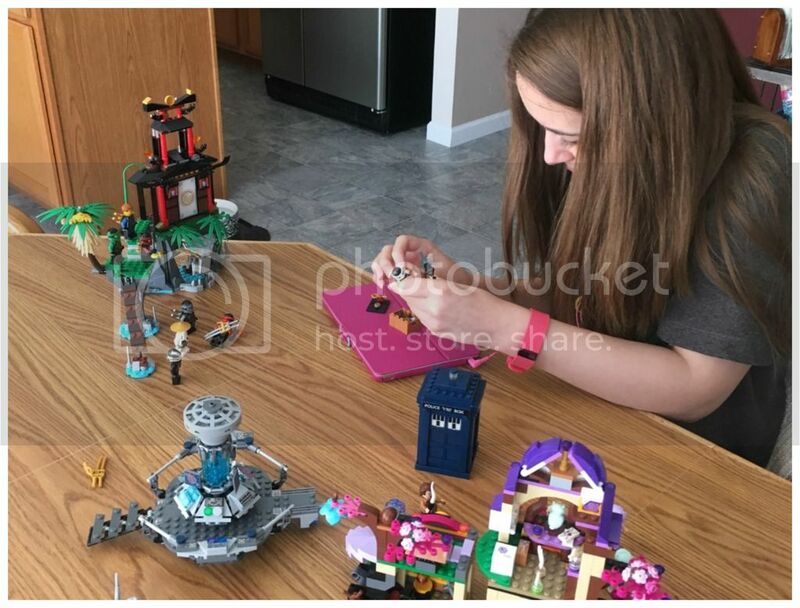 LEGOS with the Doctor Who TARDIS set, Ninjago, and Elves. I'm not sure how those all work together. Thanks to Amber's occupational therapist we are understanding more about how Amber needs to learn in order to retain information. She is very tactile, but not necessarily as one thinks a tactile learner is. The principles have carried over into her everyday life with the daily items that she has trouble remembering to complete. She cannot consistently remember the verbal list of the same five daily tasks she needs to do. Yet since I printed and laminated her list last weekend, has made remarkable progress in keeping up with her tasks. She did diligently complete a few review items this week for her summer school lessons. We're doing well with the Scarlet Pimpernel in literature, but going slower than anticipated due to concentration issues. Amber is reading the book just fine and enjoying it, however she loses focus with the study guide. It really has nothing to do with the content of the study guide, but with the delivery method. It took me a while to understand, but the OT also helped us connect the dots with this recurring issue. Apparently Amber learns best with physical products and not electronic. I don't personally see much difference in physical and electronic products, so this was off of my radar. However, Amber needs the tactile experience for retention and comprehension. We're trying various ideas to make electronic sources more tactile, while also ordering as many physical books as possible for next school year. 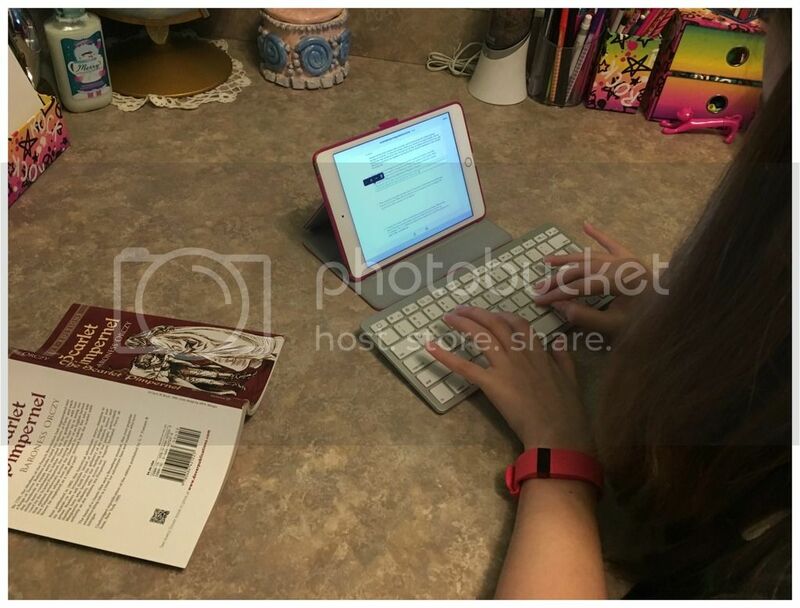 Annotating a PDF study guide with her bluetooth keyboard. It works for her. Amber had her regular therapy sessions this week along with her GI appointment, which didn't go as Amber wanted. She is not going back on Reglan for her gastroparesis because the risk of side effects is too great, and she will most probably have these motility problems for her life. We need to manage the symptoms without medication until it's absolutely necessary. I'm on the fence about this because Reglan made it definitely easier to feed her, but I worried the whole time she was on the medication because her autonomic dysfunction makes everything work differently. Next week there are more medical appointments on top of the regular therapy; I have the feeling the week is going to be spent driving to or waiting in hospitals. It's time for the hida scan and three month ultrasound checkup on Amber's gallbladder after finding a polyp and irregularities with her gallbladder earlier this year. Unfortunately we had to schedule those tests on two different days due to hospital schedules and prep procedures that would have left Amber unable to eat or drink from midnight to 4pm. We've worked it out that she doesn't have as long of a fasting period and gets liquids, but it requires two different days at the hospital. Then we have the much anticipated genetics appointment for which I am nervous-cited, as Amber says. Oh, and if you missed it, Amber reviewed an intriguing novel called The Glass Castle. She's eagerly awaiting the next book in the series! Check out the review if you have time. That's it for us this week. We are staying in the air conditioning during the 95+ degree weather and resting up from our busy week in preparation for the next one. Things may slow down in July, but I wouldn't count on it. We loved the Glass Castle. It was great. My oldest was on Raglan for 5 years (from 4 months of age to 5 years old). This was before they new about the risk factors. It was so hard to keep his body working after they took it away. I was sorry to see it go, but understand that it is not a long term med. Praying your busy week will go well. I'm glad the OT has helped you understand Amber's educational needs so much! I'm very impressed! I prefer real books to electronics myself! There is just something so satisfying about turning those pages!! I fear books are going to become extinct soon, though! I don't even know what to say about all the medical stuff, except that I'll be praying for you all! It all sounds so overwhelming. I wish we were having hotter weather. It was only 57 here! Amber is growing so fast. Enjoy your summer and the projects. Funny; there are 3 months where I am older than my husband and he just loves pointing it out for those 90 or so days. We're awaiting The Glass Castle to be available through our library. It sounds wonderful.